Here it is from Bjorn Lomborg, who made this chart below that destroys the we are doomed narrative. 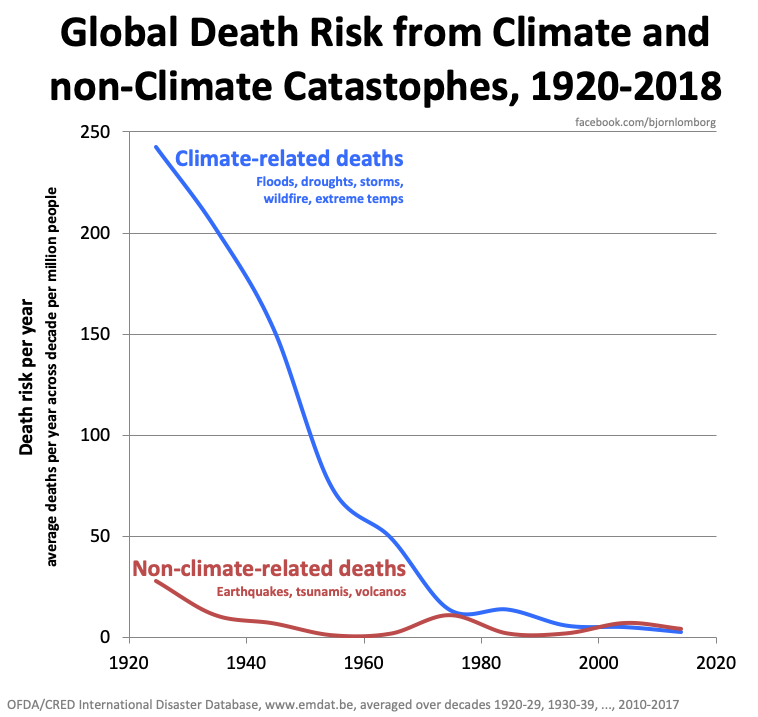 Yes this is GLOBAL total deaths, notice the massive drop...…, yet many warmist/alarmists fails to notice it in their never ending litany of DOOM! Quote: Of the 2,000 U.S. residents who die each year from weather-related causes, about 63 percent died due to exposure to excessive natural cold and hypothermia, while about 31 percent died due to excessive heat, heat stroke, or sun stroke. The remaining 6 percent died of floods, storms or lightning, according to the survey by the National Center for Health Statistics. That was from a warmist source, what about a science research source that digs much deeper? Global warming alarmists continue to over-emphasize the danger of heat and ignore cold in their papers and in stories for the media. The danger associated with this misdirection is that cold weather kills many more people that hot weather. This conclusion is clearly supported by many studies of populations in a wide range of climates. Examples are provided below from a study of thirteen countries, as well as national studies from the United Kingdom, the USA, Canada and Australia. In the link make a strong case that warm part of the year is much better for our health and better for the economy too. Reading from objective literature is good for your mental health and even your life, don't allow ignorant people to fill you up with their fear and loathing.